When you want to give a big crowd everything they want—and more—this is the outdoor speaker for you. This article walks through a number of frequently asked questions about the ION Audio Road Warrior. How loud can the Road Warrior get? How do I pair my Bluetooth device? What type of audio can I play? Does it have a radio? Is the Road Warrior wireless? How long does it take to charge? Can it be connected to a power source instead of the battery? The music is distorted or has too much bass. What can I do? The mic is causing a high-pitched whistling noise. How do I stop it? I can't hear the microphone over the music. What is wrong? 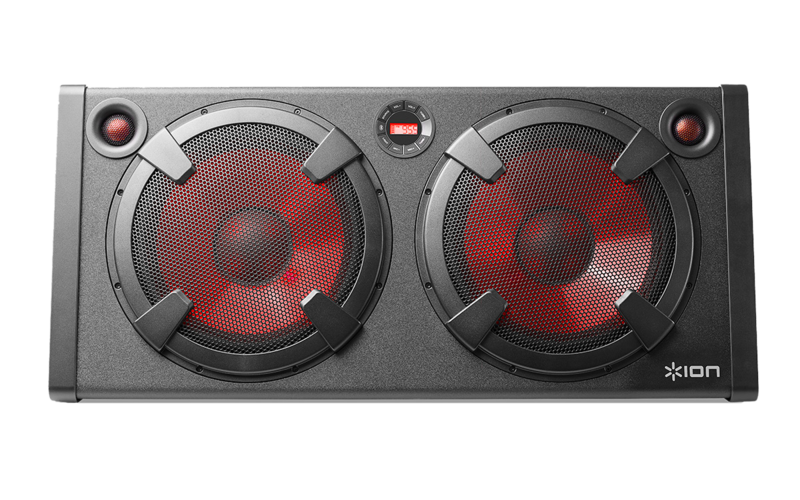 The ION Audio Road Warrior comes with 2 powerful 10-inch woofers and 2 1-inch tweeters and can pump out your music at a huge 500W (250W per channel), so it'll shake the rafters and pump out massive audio for any situation. On a full charge, the battery will last up to 12 hours when no lights are in use, or 9 hours with the lights fully on. The ION Audio Road Warrior has NFC pairing functionality built in, meaning that there are two ways to pair a Bluetooth device. NFC (near-field communication) allows data exchange from devices, such as pairing, by gently bumping them together. Check in your device’s manual to see if this feature is supported. Power on Road Warrior and press the Source button to switch to Bluetooth mode, shown on the display as — — — to search for Bluetooth devices. Navigate to your Bluetooth device’s setup screen, find “Road Warrior” and connect. Note: If your Bluetooth device prompts for a pairing code, enter “0000”. The Bluetooth icon will be lit solid when a device is paired to Road Warrior. Note: Users should consider updating their OS if experiencing trouble with pairing or playing music. Press the Bluetooth button to disconnect a paired Bluetooth device. Put Road Warrior in Bluetooth mode, shown on the display as — — —, with either a flashing or solid Bluetooth icon. To unpair, gently bump your device against the NFC logo located on Road Warrior’s top panel. What type of audio sources does the Road Warrior have? Does it have an FM radio? Additionally, it has a USB charging port that is not used for playing back audio, but can be used for charging USB devices. The Road Warrior contains internal, rechargeable lead-acid batteries for portability. Connecting the included power cable to a wall socket charges the battery, which takes approximately 7 - 8 hours to fully charge. A fully-charged battery will last approximately 12 hours at lower to medium levels, and approximately 4 hours or so at very loud levels. Can it be run from a power source instead of the battery? Yes! It includes two power connections - an AC power cable to connect to a wall electrical socket, and a 12V DC power cable which allows the unit to be connected to be powered from a car battery. Note: When connected to a car battery, the unit will not play as loudly as while on battery power or connected to a wall socket. This is to ensure that it does not damage the car's internal wiring or fuses while the unit is connected. If the sound is distorted, Try lowering the volume control of your sound source, musical instrument, or microphone. Also, try lowering the overall volume of the Road Warrior using the Master Volume knob. If there is too much bass, try adjusting the tone or EQ control onyour sound source to lower the bass level. This will allow you to play the music louder before clipping (distortion) occurs. This is probably feedback. Be sure to point the microphone away from the speaker, or stand behind the speaker with the mic. This is likely caused by the audio source. Turn down the volume on the audio source itself and you should be able to hear the microphone just fine.